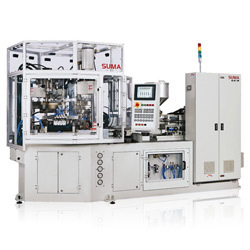 One-step Injection blow molding machine with 4 stations and 3 station. 1. One-step forming keeps bottle clean. Suitable for cosmetics, pharmacy, etc. 3. Values can be saved when mold exchange. 4. Slow mode makes mold exchange more safety and convenience. 5. PID of heaters are control by computer, It can control temperature precisely even when screw are high speed rotating. 6. Molds are not distortion, moving quickly and smoothly without vibration. 7. Producing quickly, stable and low noise. 8. Compare with others can save 15% energy. 5. Screw L/D ratio: 22. 7. Blow mold clamp: 130kN. 8. Max. Die. set: 620 x 400mm. 10. Dry cycle time: 3.2sec. 11. Oil tank capacity: 240L. 13. L x W x H: 4 x 2 x 2.4.